Can I save seed from my tomatoes and start my own plants next year? That’s the short answer--now let’s get into the particulars. Just because you CAN do something doesn’t necessarily mean you SHOULD do it or that you can expect desirable results! If you just want to do this as a gardening experiment so you can observe the process of seed germination and plant growth, then by all means go for it. And, if kids are involved, all the better--it gives them a hands-on chance to participate in the fascinating process of gardening. But, if your reason for saving seeds is to start your own tomato plants that will actually produce tasty and photogenic tomatoes--then variables come into play that could cause your experiment to go awry and leave you with less than desirable results. The first consideration is your seed source. Are the seeds you are saving from a tomato you purchased at the grocery store--and you want to grow some more big fat tomatoes next year like this one? Planting seeds from grocery store tomatoes is not recommended, as most of the tomatoes purchased there are hybrids (bred to give that big fat tomato appearance). The next generation of plants and the tomatoes they produce may not exhibit the same traits as the grocery store giants--in fact, if the seeds do germinate and produce tomatoes, the fruit may be misshapen and undesirable in appearance and taste. My mother was a great saver of seeds. 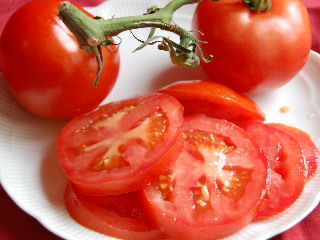 And she knew the exact heirloom varieties of tomatoes she was dealing with from year to year. She even kept accurate written records--she would write the name of the tomato onto the paper towel on which she dried the seeds of that tomato!! And she didn’t use the fermentation method that some seed savers recommend. She just spread the seeds (along with a little bit of unavoidable tomato mush) from plump tasty tomatoes onto paper towels, labeled them, and kept the drying goods under surveillance on her cool enclosed back porch until time to start new tomato plants the next spring. Here’s a suggestion--buy some seeds (or young plants) of old reliable heirloom tomato varieties from a trusted seed source (like the Burpee ® Seed Company). Enjoy the tomatoes you grow from those varieties--and then save some of the seeds from those tomatoes and plant them next year to see how they do! Buying viable seeds from a trusted seed company requires only a very small financial outlay, and it’s one way to get started on your seed saving experiments. Then, along with the plants you start from your saved seeds, plant some more seeds you’ve ordered from the seed company and compare the results of the two crops. Here’s a similar story in the great tradition of seed saving experiments--saving an avocado seed and growing it into an avocado tree is a fun project, but you’re unlikely to produce any consumable avocadoes this way because of the hybrid avocado parents. Much the same holds true with tomatoes.